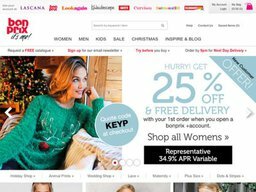 Bon Prix in an online clothing website that gives its customers the opportunity to purchase clothes that they would not find anywhere on the high street. With all clothes sizes being charged that same prices, Bon Prix offers excellent value for money with great quality items. First established in the UK in 2005, Bon Prix fashion aims to reflect the latest catwalk tends, to flatter all women, with pieces that can be worn again and again. Purchase the wide range of shirts for a greatly reduced price from Bonprix. Purchase tops for a huge discounted price from Bonprix. The company stocks clothes in sizes 6 to 32, and pride themselves on being able to cater for all woman, of any size. There is also a huge collection of shoes and fashion accessories to compliment the up to date outfits. However it is not just women's wear that Bon Prix stocks, they also have a huge range of lingerie, men's wear and kid's wear so that you can shop for all the family on this exclusively online site. With thousands of dresses, skirts, shirts, trousers, jackets, jumpers, coats and cardies stocked at low prices, there is no better place to get that high fashion look, without even having to leave the house. Everyone is so busy these days, so Bon Prix have tried to make their website as customer and search friendly as possible. Whether you want to enjoy the luxury of browsing the hundreds of items in stock, looking for that perfect piece, or making use of the simply search facility to find exactly what you are looking for in a few clicks, you are sure to leave satisfied. Regular emails can keep you on track about the latest trends and fashion must haves, while the company blog is available 24/7 for fashion advice and style inspiration. After listening to feedback from some of their customers, the company have made some effective changes to their website, creating an enjoyable shopping experience. You can now shop on the go via the new mobiles site, use the enhanced search tool to find exactly what you want quickly and easily and make use of the new account management tool. Improvements are always being made to the site, with new things added almost every week. Bon Prix has another way to make life easier for its customers by providing them with the chance to sign up for a Bon Prix + Account. This account enables users to spread the costs of payment over time, not having to pay a penny up front, making buying the latest fashion trends more affordable. It also includes the added benefits of being able to try your product for 14 days, before deciding if it is right for you. You will also be sent exclusive VIP treats and deals, plus easy checkout. Not only that, but when you sign up, you get 25% and free delivery off your next order! Bon Prix prides itself in being able to offer affordable fashion to all women, which is why they offer a hug range of Bon Prix discount codes, vouchers and sales throughout the year, as well as a monthly payment option. A lot of the Bon Prix voucher codes that can be found are available on the website, however some can also be found elsewhere online, so it is worth having a search for a deal that suits you before your purchase. Other ways to find great deals is to check out Bon Prix social media sites, such as Facebook, Twitter and Pintrest, to be in with a chance of getting an exclusive Bon Prix discount code. Returns are no longer a chore! Buying almost anything from Bon Prix comes with a 14 approval policy, meaning if you are for any reason unhappy with your product, use Bon Prix returns for a full refund if it is with 14 days. Your items will be guaranteed approval if there is nothing missing, they are unused, in the original packaging if possible and come with the correct documents. Any refund that you receive will be via the original payment method. If the item was added to your account, then this refund will be reflected in the next monthly statement that you receive. They will process the refund as quickly as possible, so this could take anywhere between 7 to 10 days to come through to you. There are a number of ways to return an item. One way is to take it to your local post office. You must ensure that it is tightly wrapped, and included in your packaging is the returns note, with the reason for returning your item. Make sure the Bon Prix address is printed clearly on the front. A second option is using parcel shop returns, the website has a detailed video on how to return items in this way, which is well worth a watch. The best way to find your nearest parcel stop is by visiting www.myHermes.co.uk/parcelshopfinder. Again, make sure that your items are securely packaged and that the reason for the return is enclosed within. Lastly, you can return your items using a courier service. Simply put a tick next to the items that you wish to return on your returns form, along with the reason, and package it in with your items, then stick on the returns label. A courier collection can be arranged by visiting the 'my account' section of the site. Your order will be with you in no time! Delivery options include a range of times and prices depending on how soon you wish to receive your product, and what the product is. For fashion, footwear and small home items, the standard delivery rate is £3.99 which will take between 2-5 days and delivers to all UK postcodes. For next day delivery on similar items, this is priced at £5.99. If you wish to have larger items or heavy footwear delivered, this could range from £10 to £25, depending on the size and weight of the item, with high value items at the set price of £25.